When it comes to finding the best possible look for your kitchen worktops, don’t ever worry about budget or costs – as here at Pure Quartz, we are more than ready and able to help you find that ideal look and fit which will not only complement your existing kitchen suite but which will also weather the years to come. As leading specialists in our area for top quality stone and quartz worktops, worktops, flooring and more besides, all you need to do is take a quick look at our catalogue and let us know which looks appeal to you the most! For offices, bathrooms, wet rooms and more besides, we cover all rooms and bases. But today, we’re going to be focusing on the kitchen – easily one of the busiest rooms in the home wherever you go – and an area which therefore requires only the highest quality quartz kitchen worktops for that impeccable look, feel and finish. Quartz kitchen worktops carry that amazing natural sheen and shimmer – available in a range of different colors and styles, and available for fitting in kitchens across the board. Our top team specialises in finding the best possible looks and fits for your existing aesthetics as well as your personality. Pure Quartz handles and specialises in a huge range of different stones and materials, meaning that you can always be assured of a great variety of choice. Rest assured, we always make sure that the quartz and stones we provide are of the highest standard possible – assured for years of use and protected against scratches, scuffs and other mishaps. With our aftercare services, too, you can ensure that your worktops remain well-maintained and cared for throughout the years to come. We think quartz in various colors, black, white, grey or otherwise, can look spectacular as part of any kitchen installation – new or existing – and we’re here to show you exactly what a great set of worktops can bring to the overall look of your space and suite. Pure Quartz work hard across South East London to ensure that quartz kitchen worktops are designed and installed to the exact millimetre – meaning that we are always open to bespoke or custom requests and whether you’d like a quartz counter or worktop in dazzling pink or glorious grey. We will help you to find a design and look that’s both unique to you and completely functional and practical for you to use on a daily basis. Why spend more on options and suites which can’t be designed or bent to your will? Work closely with our design team and we’re sure you’ll find that incredible look you’ve been dying to put into your kitchen for years on end. Quartz designs come in all shapes and forms, and what’s more, they are always a brilliant focal point for family, friends and guests alike. Why opt for anything less? 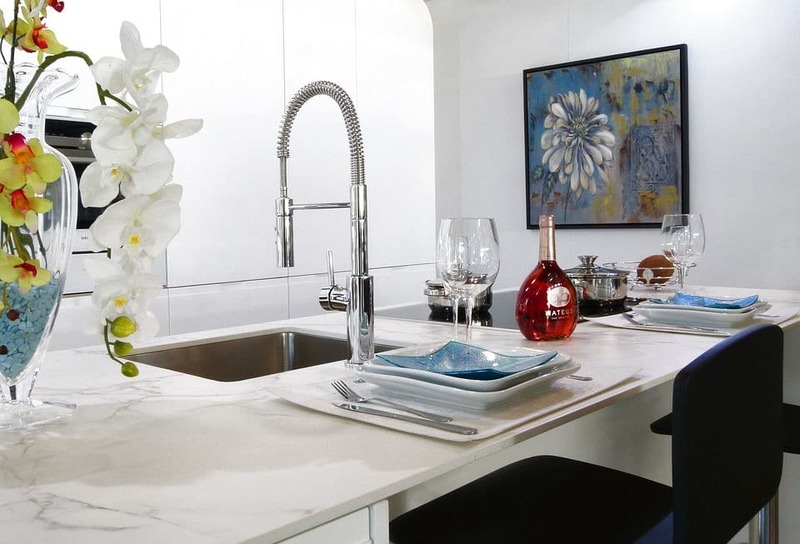 It’s your kitchen – and while we are trusted experts and dealers in all things stones and quartz for kitchen design and installation, we leave plenty of the design choices down to you. 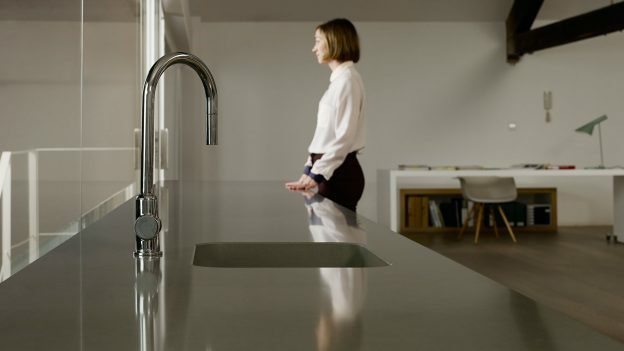 It’s our job to help you find the right fit with brilliant quartz worktops and worktops that portray your personality and sense of aesthetics as much as anything else – and getting down to the nitty gritty of the design is entirely down to you. Make choices that complement your existing kitchen – choose a look and feel that helps to build your dream kitchen suite and space – we have plenty of options and choices for you to take advantage of – all of assured quality and all available for you to take advantage of at your leisure. Bespoke countertop design and manufacture is what we do – so never be afraid to share some of your ideas with us. Whether in Bromley, Lambeth or London, we’re here to help. While the best quality in luxury fittings may often come at a price, we here at Pure Quartz are proud to be able to offer quartz kitchen worktops to fit a wide range of budgets and financial profiles. This means that we will be more than happy to offer you either a closer look at our range to help you find an option that’s cost-effective for your household improvement budget, or we will work with you to build up a custom or bespoke plan to satisfy both your budget and your desires. You should also remember that you never have any obligation with us – we will quote you based on your needs and desires – and based upon your budget parameters – and from here, we will be able to set you up with a deal which you will be proud to come home to – and one which won’t break the bank. 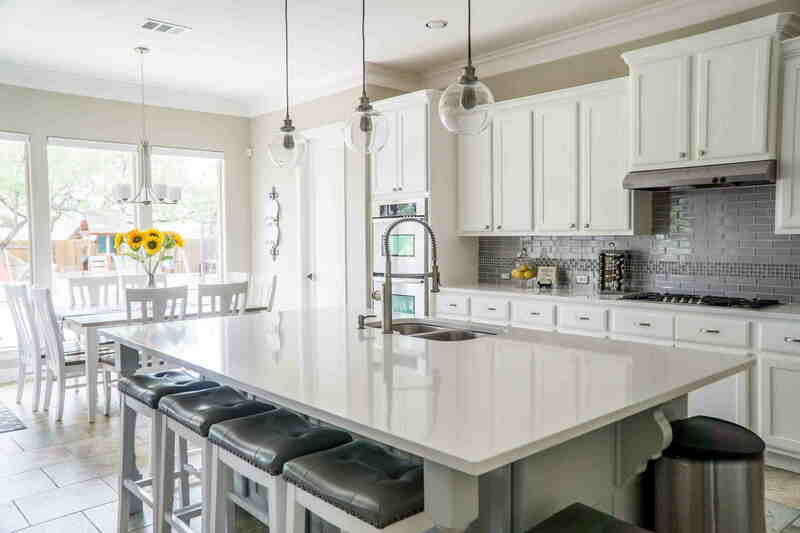 When it comes to finding the perfect look for your kitchen, it’s time to consider the types of quartz and stone that complement the look you are aiming for most closely. From classic quartz to cambria quartz, there are more stones and choices available than you may have previously been aware of – and it’s our job to introduce them all to you! Why not pick a stone that complements your existing kitchen display – opt for quartz kitchen worktops that shimmer effortlessly – and which remain resistant for years and years to come? We also supply and handle stone in the form of beautiful creations from Istone, Arenastone, Compac, opal quartz, Unistone, Santmargerita, Lunastone, Cimstone, Caesarstone and Silestone. We also work with Samsung to create some truly wonderful stone looks and worktops for our customers. You never know what look you might find! Quartz doesn’t just come in one shade or hue – our local supplier will be proud to present you with quartz and stone in a variety of colors and looks, meaning that if you prefer vibrant pinks, blues or greens over classy blacks and whites, it’s entirely your choice! Our team will work hard to find a look that not only complements your existing kitchen design, but which also brings out a wonderful aesthetic in your home you never knew existed. Don’t limit yourself to basic or flat colors – come and take a look at our beautiful range and let us find the ideal look for you! Pure Quartz are local experts in kitchen and home redesign – meaning that whether you are looking for great-looking quartz for your kitchen, your bathroom or your office, we’re here to make sure you have a world of choice and flexibility. We only work with the highest in quality stones and stone providers, meaning that you can always rest assured that you will receive the best your money can buy – what’s more, you’ll receive incredible value – we’re focused on cost-efficient plans and ideas to fit a range of budgets and timescales. For plenty of homes across South East London, we are the local supplier to turn to. Why not all Pure Quartz today on 01233 733111 to find out more at your convenience? Alternatively, Please use our web form to email a query to us when you can – and we look forward ten worktops into your home as soon as possible! Spring is a time for fresh beginnings. We’ve invigorated our collection with 3 brand new colors with unique depth and coloration for any style. This entry was posted on July 3, 2017 by admin. Inspired by luxury, playfulness, and an unrelenting passion for the extraordinary, Caesarstone has introduced two new colors to expand our diverse collection.